The trails at Sope Creek are situated alongside a tributary to the Chattahoochee River, and have a lot of history behind them. The trails here are all intermediate, and they connect to the ever popular Cochran Shoals trail system as well. Both provide views of creeks and the Chattahoochee River, offering some lovely vistas during your ride. The trails at Sope Creek are hidden just outside the Perimeter, and this park is part of the Chattahoochee River National Recreation Area; the creek here is a tributary of the Chattahoochee River. The East Cobb location makes for a great place to fit in a ride before work or after work for those living north of the city; you can even squeeze in a ride on your lunch break if you work around the Marietta area, as Sope Creek is not far from Delk Road. This park is in a very nice part of town, and heavily is patrolled by rangers, providing a very safe place to ride. Sope Creek is the first place Sherman’s army crossed the Chattahoochee on his infamous Atlanta campaign, and it was a Cherokee holdout during the Trail of Tears; a Cherokee man by the name of Soap lived here after the Cherokee people were driven out of Georgia. The creek and the park were named for him. The single tracks paths in this historic area incorporate some mild hills, providing vistas of the creek and the post-Civil War mill ruins below. As you glide along the secluded trails here under the canopy of trees, you get a sense of being farther out of town than you really are. You’ll cross over a few creeks, and probably even see a deer or two. After winding through the woods for a spell, you’ll come to a clearing where the dirt trails give way to gravel. Here, you’ll see an inviting sundeck on the side of the clear Sibley Pond, which is a great place to take a break and enjoy the sun. You can often see turtles perched on logs near the edge of the pond. 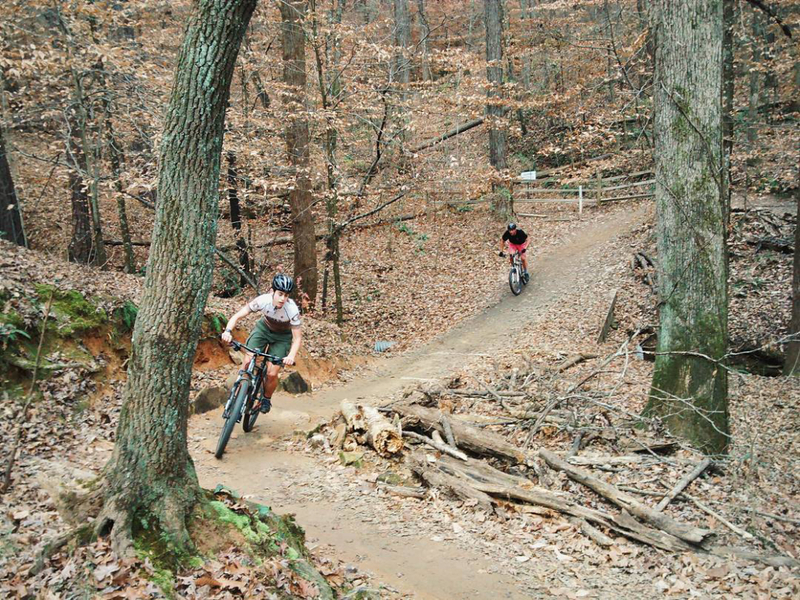 All the trails at Sope Creek are marked as intermediate, but beginners may ride safely on a few of them. If you decide to keep going past the pond, you’ll ride into the Cochran Shoals area, which has a gravel loop along the Chattahoochee. All levels of riders will have fun here. The well-maintained trails here were built by SORBA, and there is ongoing construction here to both expand and improve the existing trails. Biking here during rain is not prohibited, unlike most places; however, it is not advised to bike during rain or shortly thereafter, as this destroys the bench of the trails, and also increases risk for injury. The trails here at Sope Creek are very well marked, and easy to navigate. Most are for mountain biking, but some are strictly reserved for pedestrian traffic and these are very clearly marked, so there is no confusion. There are four parking lots in this area. Three of these lots are for the Cochran Shoals trails, which connect to Sope Creek: Columns Drive, Powers Ferry Island and Interstate North. The main lot for Sope Creek is off Paper Mill Road (listed). As are all parks that are part of the Chattahoochee River National Recreation Area, there is a $3 daily fee to park here, and annual passes can also be obtained for $35 at https://www.pay.gov/public/form/start/11655368/.